Godiva® milk chocolate is famous around the world for exquisitely rich, silky smooth milk chocolate. 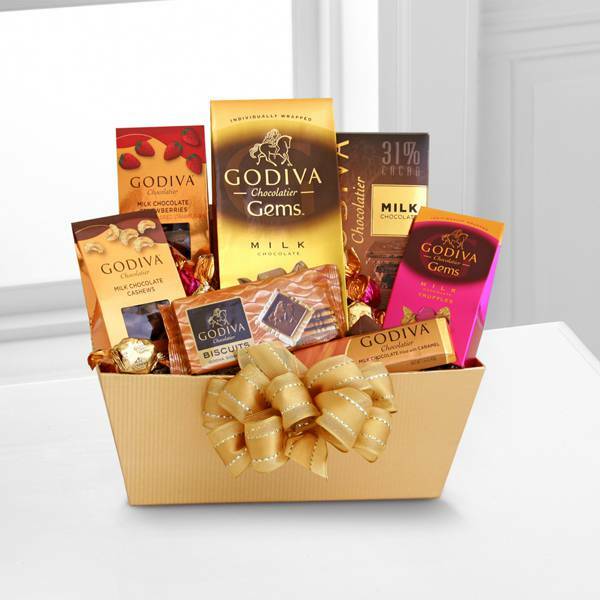 For the milk chocolate lover in your life, this premium assortment is sure to delight. Indulge them with milk chocolate Gems, chocolate cashews, chocolate strawberries, milk chocolate with caramel bar, 31% cacao chocolate bar, milk chocolate Gems truffles and Godiva® signature chocolate biscuits. Simply exquisite! 12/07/2017 3:14PM godiva is simply divine. i treat myself every holiday to some of their goodies. nice to see more places carrying them online now. shipped quickly to saratoga springs— Kelly C.
11/27/2017 1:11PM what better way towoo her than flowers and godiva. on behalf of myself and miss jennifer, we thank you for making our date perfect and for the timely delivery in white plains ny.— Stephen C.